Hmmm, this is eerily similar (in both ingredients, taste, and texture) to a recipe I made not too long ago, Roasted Red Bell Pepper Sauce. But the thing is...this one is so much better! And so simple and fast, this is a great appetizer or quick "gourmet" finger food for unexpected company. 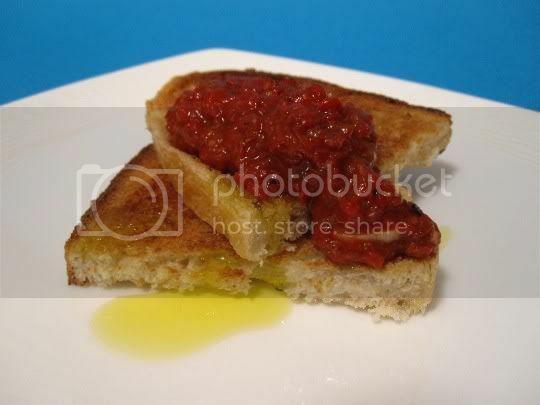 Just add roasted red peppers, garlic, fresh bread crumbs (use the bread that you'll need for the toasts), balsamic vinegar, and what I like to think of as the "secret" ingredient--sun-dried tomato pesto--to a blender or food processor, and whirl away until smooth. Well, this puree won't be totally smooth, but the slightly chunky texture is great to put atop the bruschetta toasts...which is just sliced Italian bread popped in the broiler for a few minutes. The recipe suggests seasoning the puree with salt and pepper, but I think it's fine as is and has plenty of flavor. It's tangy, spicy, and a little sweet, with bits of fresh minced garlic throughout. A slight drizzle of extra-virgin olive oil adds a nice and strong herbal flavor, and even makes me think of the bread-olive oil dipping at restaurants. Yum! Make again? Yes. Sun-dried tomato pesto is worth keeping on hand to quickly whip up this dish.